Our Group HSE policy mandates all our businesses to identify, assess and respond to environmental risks, efficiently use resources and prevent pollution. Undertaking listed activities without the correct environmental authorisation or failure to abide by conditions set out by licences, such as water use licences, on a project. Project disruptions due to extreme and unpredictable weather conditions, including floods and storm surges. Increasing regulatory requirements related to energy and climate change, which could lead to increased costs. New regulations, however, may also lead to opportunities in a low-carbon economy or water-restricted areas. Our operations are required to implement and comply with ISO 14001, an international standard for environmental management systems. As a multinational organisation, our focus is to consistently apply and embed critical environmental standards across all our operations by creating a common purpose and approach. 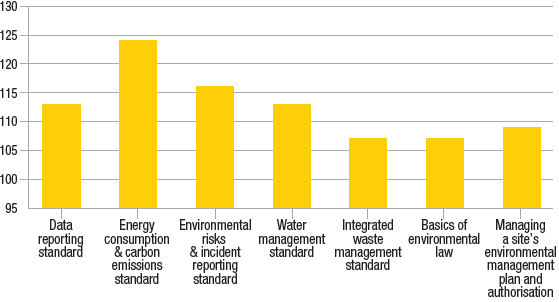 Our standards guide operations on how to manage environmental issues, including carbon emissions, energy and water consumption, waste management, regulatory compliance and quality environmental data. Reviewing our material environmental issues and setting new environmental objectives and targets. Updating our environmental reporting protocols to align to updated reporting frameworks, including the amended Carbon Disclosure Project and the Global Reporting Initiative. Providing updated environmental training and awareness to employees. Further enhancing the programme to support the environmental goals of our clients. Progress on these initiatives will be reported in the next Murray & Roberts Sustainability Report. All operations are certified under ISO 14001 and are on track to transition to the new ISO 14001: 2015 standards. The Power & Water platform is already certified. Our carbon emissions, energy and water data is now fully assured under the International Standard on Assurance Engagements (ISAE) 3000. Environmental training for employees focuses on improving practical understanding and compliance at project level. 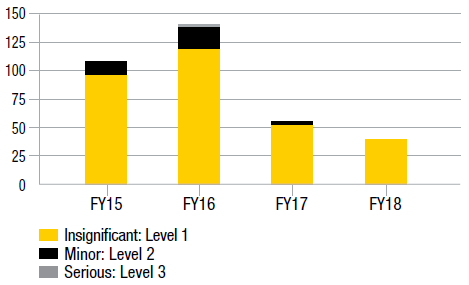 In FY2018, there were no material environmental incidents and 39 Level 1 incidents, a 28% decrease compared to FY2017. Level 1: negligible reversible environmental impact, requiring very minor or no remediation and is contained within site limits. Level 2: negligible reversible environmental impact, requiring minor remediation and is contained within site limits. Level 3: moderate reversible environmental impact which is short-term, requiring moderate remediation and is contained within site limits.